Many organizations today operate across boundaries - both internal and external to the organization. Exploring concepts and theories about different organizational, inter-organizational and international contexts, this student reader aids understanding of the individual's experience of working within and across such boundaries. The book adopts a critical approach to individual experience and highlights the complexities inherent in these different layers and levels of organizing. Comprising a collection of key articles and extracts presented in a readable accessible way, this book also features an introductory chapter which provides an overall critique of the book. Each part features a brief introduction before analyzing the following key themes:managing aimspower and politicscultural diversityinternational management perspectivesthe darker side of collaborative arrangementsSome of the readings will specifically address collaboration `head on' whilst others will provide an important context or highlight significant theoretical and practical issues that are considered relevant and interesting within the framework of the themes presented. 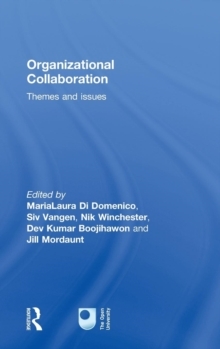 As such, this book differs from existing titles as it sits bestride collaboration and organizational behaviour / theory in order to inform learning of exchange relationships on inter-personal, intra-organizational, and inter-organizational levels. The articles included are selected as critical in approach, straddling and addressing the central contexts described above, and highlighting the experience-centred nature of learning that can be derived from the content presented. This comprehensive reference will be useful supplementary reading for organizational behaviour courses as well as core reading for those students undertaking research on collaboration.